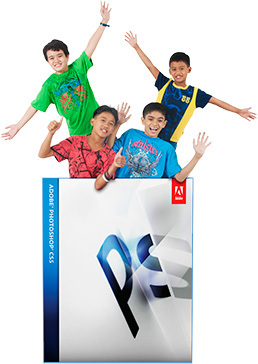 This summer, help your children learn the most popular and useful tool for graphic design, Adobe Photoshop. To be sure, students use graphics tools to enhance their school work; the science poster, the history presentation, the math project and more. And there is no software more often used and more helpful for project requirements as well as personal hobbies (e.g. photography) as Adobe Photoshop! This workshop is ideal for kids, 9–15 yrs old. Older teens can still attend the workshop if they want to, or choose to attend our Adobe Photoshop CC Basics class. The training teaches your child a software that can help them express their imagination and ideas in different, creative ways. Young people from 9–15 yrs old, who want to learn new computer tools and explore what they can do with these new tools. For kids who've taken our Photography for the Young at Art workshop, this Photoshop class will give them more creative options. There is nothing to bring to the workshop, except an “open” attitude to learning. PCCI will provide the computer workstation, complete with software and source materials (for hands-on work), for each participant. It is of course recommended, that the young participant has access to a computer and the necessary software, at home, in order to apply the lessons learned in the workshop. Mario Ramirez has been a computer teacher since 1988. He has worked with young people beginning with tutoring his own son. He’s had a variety of experiences working with young people; school work review (math), computer-aided-design, and of course, Photoshop. Mario regularly handles classes with diverse participants. At PCCI, students as well as professionals, entrepreneurs, photographers, artists among others, and from various countries, have attended and learned from his Photoshop classes. He always tries to make his classes enjoyable so participants stay interested and engaged. Mario is both an Adobe Certified Expert (ACE) and an Adobe Certified Instructor (ACI) in Photoshop CC. Teacher Mario is such a cool teacher, and he is very patient with kids. This is my best class ever, and I like the tablet because it is so easy to use, and it is so cool. He [the instructor] is very kind, energetic, very funny and friendly.